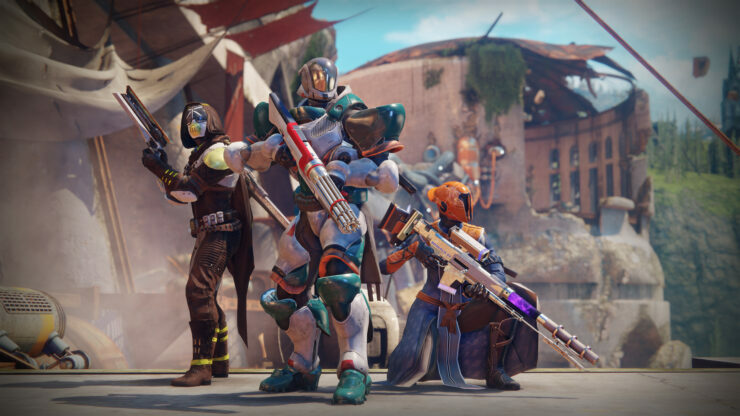 Bungie Says There Are No Specific XB1X Enhancements Planned for Destiny 2; "Same Experience"
Our on-site editor Kai Powell had the chance to play Bungie’s greatly anticipated Destiny 2, the sequel to the online first-person shooter that boasted 25 million registered users in November 2015. We’ll have his hands-on impressions available soon, but he also had the chance to briefly speak with Bungie’s veteran (he has been with the company for twelve years now) Design Lead Lars Bakken. His colleagues confirmed a couple days ago that Destiny 2 would run at 30 frames per second on Xbox One X as it does on PlayStation 4 Pro. With Microsoft’s console due on November 7th featuring significant additional horsepower, though, we figured there would be some visual enhancements at least – higher resolution textures, better particle effects and the likes. However, that doesn’t seem to be the case. Bakken said that Bungie is aiming to deliver the same experience on all platforms and so far, there are no specific enhancements planned for the Xbox One X. Bakken also stated that on PC, Destiny 2 will have aim assist if you are using a gamepad but it won’t have it when playing with mouse and keyboard. The apparent lack of XB1X enhancements will undoubtedly disappoint those who are planning to play Destiny 2 on the console and at the same time, it’s yet another spark in the increasingly heated long-distance argument between Microsoft and Sony. PlayStation Europe’s boss Jim Ryan said yesterday that it’s only rational for publishers to cater to the lowest common denominator and cited the fact that many developers didn’t properly exploit Sony’s PlayStation 3 as a historical comparison. In the same interview, he openly said there are no nefarious plans to hold back improvements to games that have a marketing deal with PlayStation – just like Destiny 2. I’m gonna struggle to not get myself in trouble on this one. I’ll just say: I don’t know anything about other development deals. You mentioned some things around clauses and stuff that I don’t know anything about. But if anybody was to do a deal to hold back technical innovation on a video game anywhere else, that doesn’t feel good for the industry to me. On a more positive note, check out how gorgeous Destiny 2 can be in the latest official screenshots and sterling 4K@60 PC gameplay footage. The game will be out on September 6th for PlayStation 4 and Xbox One, while PC gamers will have to wait for October 24th.